Auctions continue to be favoured by the real estate industry as an effective and efficient method of sale. In the past 12 months according to REINZ data a total of 15,865 properties were sold by auction representing over 1 in 5 of all property sales. In Auckland the numbers are far higher with over that same period 38% of all sales being by auction. Next month such a comment would be judged to be misleading and inaccurate under the terms of reference of the Fair Trading Act. This advert for April auction results might well present a somewhat different picture. This move will bring the reporting of auction results much more in line with Australia which publishes 'clearance rates' weekly within 24hrs and judges an auction solely by the fall of the hammer. A further implication of the amendment is that once the working day period has passed then the transaction will no longer be considered an auction and therefore the use of the Auction Sale & Purchase Agreement will cease to be appropriate as the property becomes open for offers by private treaty between the vendors agent and the prospective buyer. This is of importance for buyers to appreciate as the purchase terms and conditions need to be re-stated on a new S&P Agreement. I am a big fan of Twitter as my predominant news feed, far more a news media service than a social media service. It is easy to follow those people and organisations that are the pipe-fee of news that is contextual top whatever area of interest you hold. For me it all about property and the real estate industry in New Zealand and Globally. It was through one of these followers that I saw this chart providing an interesting perspective on the comparative performance of US house prices over the past two decades on an index whereby December each year becomes the base for the growth / decline in house prices month by month through the year. So for the US market which went through a major boom and bust in the past 20 years it is interesting to see that this year they are tracking to see close to the best growth in house prices (admittedly off a low base). The chart below shows the actual indicies of house prices across the major markets over that 20 year period. 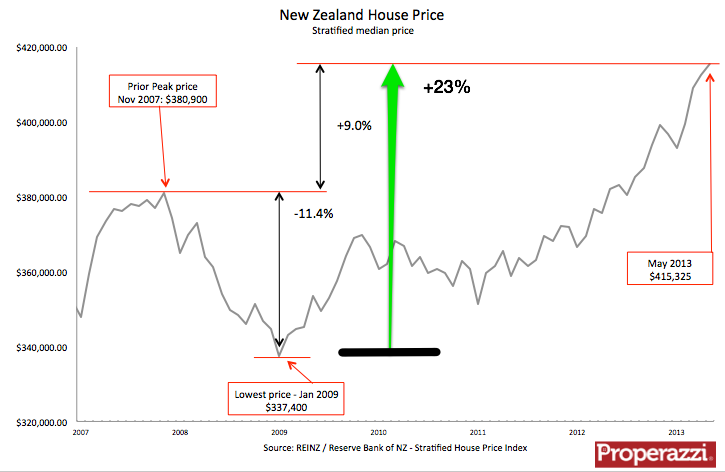 It is quite striking the similarity between the US and NZ house price index - the worst performance year is matched at 2008, the US slipping further down 10% vs 7% in NZ, the best year is very close; NZ is 2003 at 13% with US 2004 with 11%. This would certainly be a clear demonstration that whilst domestic property prices have a local market factor they do seem to follow in step to global economic effects that flow through to the property sector. Are we losing access to vital property data? I feel like the lifeblood for the analysis of the property market is being drained from me. I have in the past commented as to how fortunate we are in NZ to have such rich property data, how timely it is and how openly accessible it is. Sadly I now have to report that the core custodians of property information are heading down a path – either collectively or independently to close off access to such valuable data. First we had the proposal by Property IQ to acquire Terralink. This is now in the hands of the Commerce Commission who I am confident will find that this acquisition would seriously remove competition in respect to consumer property information – for a start it would be the death of Zoodle as Property IQ would strengthen the dominance and profitability of QV as the only place where you could get as a member of the public, historical sales data and estimated property valuations. The decision is due from the Commerce Commission on the 11th October so I will await that notice with great interest. Out of interest the original date for the decision was the 13th September, this has been extended - could be that the CC team is looking closer into the issue or maybe their overall workload is holding them up? Following that potential blow I now see that the Real Estate Institute (REINZ) is quietly closing off more and more data that was at one time publicly available for free. Firstly they removed the downloadable spreadsheet for the Stratified House Price Index which provided historical monthly median and stratified median prices for Auckland, Wellington, Christchurch, Other North Island, Other South Island as well as National data month-by-month back to 1992. The offering now is purely a pdf chart. The raw data allowed me to produce the analysis charts I have regularly done to highlight the % variance to market peaks and troughs as per the example here. Thankfully as I collated the data from 1992 though legal access to these spreadsheets in the past I can now update the data set with the monthly figures REINZ publishes. The other database that REINZ has turned off is the Market Facts Graph capability. This provided the public with the opportunity to access core data by month back to 1992 by aggregated suburb showing median price, number of property sales, median days on the market and total sales value. Below is an example of this report when it was available showing the wider Wellington region for a 12 month period. All that is now provided by REINZ in regard to this data is the press release together with the regional data pdf. The other valuable report the Residential Market Statistics which provides the regional monthly data for recent months down to aggregated suburb level is also no longer published after July; so my advice is to go and grab the archived residential reports before they too are removed. In my opinion restricting access to data that was once available for free is a backwards step. This is both in terms of the general principle of making data accessible, so that people can be allowed to analyse and provide perspective and insights; and in the specific sense of an industry that I am sure wants to help people be better informed about buying property rather than what could be perceived as a revenue generating decision as highlighted by the newly appearing references to paying for access to data from REINZ by the general public. It is interesting to compare the expectation of property prices to that of actual sales prices, as in theory it provides a guide as to the state of the market. The closer aligned they are the more realistic are seller expectations, a situation more common in a rising property market. Conversely the more divergent, the more out-of-touch are the sellers’ expectations, usually as a consequence of a falling market. Today’s market is certainly not falling (well not at the moment) and presented below is the trending chart of asking prices and sales prices for the past 6 years covering this important period from just before the property crash, right up to date – May 2013. It is only in the past 6 months that the divergence between asking price and sales price when seen on a 6 month moving average basis has reduced to below 10%, a level it passed through in 2008 on the way down to a gap of 15%. Across New Zealand the stratified median sales price for property rose again in May to $415,325. That places the median price of property across the country some 9% above the peak of the property market pre-global financial crisis back 6 years ago in Nov 2007. These figures are taken from the REINZ stratified house price index, in my opinion the most reliable indicator of house prices. However when viewed against the bottom of the market in January 2009 the market is up 23%. At the same time the asking price for NZ property has risen in May to a new record level of $454,795 based on the data collected by Realestate.co.nz in their NZ Property Report. This record high is up 7% from the peak of the market pre-global financial crisis back in January 2008. When measured against the bottom of the market in November 2008 the asking price expectation has risen a more modest 14% over the period. In the Auckland market the gap between asking price and sales price is much closer than across the whole of NZ. It is now back with sales price within 5% of the asking price on a 6 month moving average basis. A significant tightening as compared to the 15% gap back in early 2009. The stratified median sales price for property in Auckland rose again in May breaking through the ceiling of $600,000 for only the second time. That places the median price of Auckland property some 19% above the peak of the property market pre-global financial crisis back 6 years ago in July 2007. 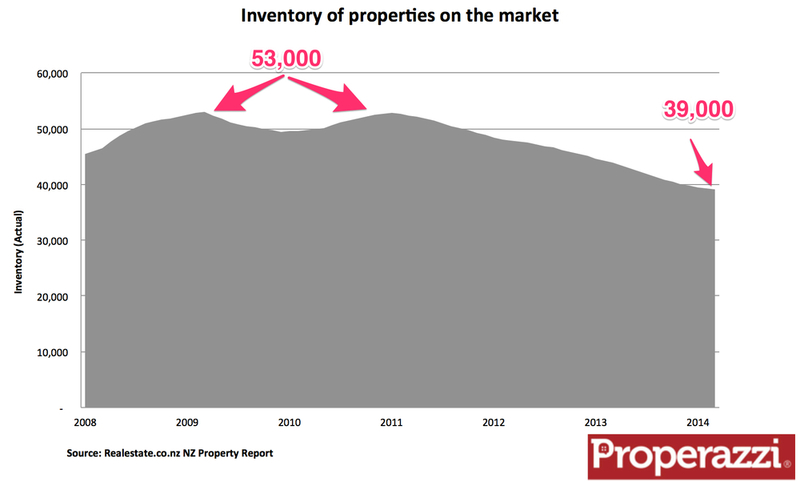 However what is somewhat more alarming is the fact that since the bottom of the property market in Auckland in November 2008 the stratified median sales price has risen by 39%. At the same time the asking price for Auckland homes has risen to see in May a new record level of $631,656 based on the data collected by Realestate.co.nz in their NZ Property Report. This record high is up 16.5% from the peak of the market pre-global financial crisis back in January 2008. Since the low point in asking price of October 2008 the mean asking price has risen by 26% to the new high of $607,600. As to the future, the analysis of the past shows that on the way down as we can see in 2008 the asking price lead the change to reverse the decline as vendors started to establish a base of asking price expectation which at the bottom of the market was met by demand and that began to fuel a rise in sales price. This time around we will need to watch for a turn in sales price as this will lead the asking price trend by at least 3 months. Watching the property market as an active investor or an interested property owner you are, I am sure, always looking to see where the current trend is heading to try and be ‘ahead of the curve’. There is one basic fundamental that is key to remember and that is the fact that trends in property prices always follow trends in sales volumes. Sales are a reflection of demand. If demand picks up, sale spick up and as a result property price rise. This is not the case with most other products or services; as a rise in demand usually leads to a rise in supply and that manages through competitive pressure to curb price rises. In the property market as the base product is not homogenous the supply side (vendors) is very poor at responding to the demand side pressure. Just read the constant headlines of the NZ Property Report of the past 2 years – low inventory of houses on the market drives a sellers' market leading to rising asking prices and, as we have seen recently, rises in the selling price of property. Naturally as demand falls, then sales fall, and again as a result of the inability of the supply side of the property market to adequately and effectively respond to this change, the levels of unsold properties on the market rise and this drives a buyers' market which will see prices ease or fall. This is why to be a smart observer of the market you need to focus on the property sales volume trend, as the price trend is a ‘rear-view-mirror’. Sales are up, they are slightly stronger and yet they were down! As with all statistics it is how you look at them; get too buried in the minutia of the granular data and you cannot see the trends, take too holistic a perspective and you risk missing the inflection point. To assist in this process of spotting trends I have developed a couple of charts which I think show a valuable perspective of the property market. First the core data of monthly sales data for the past 13 years, this certainly shows that sales have risen considerably since 2010 and just last month topped 8,000 – however 8,000 a month sales were the norm rather than the exception through 2002 to 2007. This speaks to the fact that the current fascination for property transaction is nothing as compared to those heady days of the financial easy-money honeymoon, pre GFC. 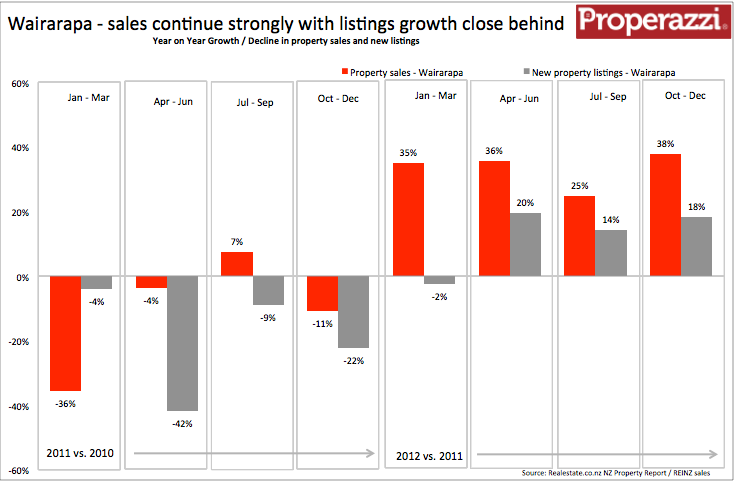 The trend of property sales growth comparing year-on-year as the chart below shows, provides a valuable insight. We have seen 2 years of consecutive year-on-year percentage growth, compare that to the 3 years of consecutive growth at the beginning of the last decade and the 2 years of consecutive decline through 2008/2009 and you get a reminder that property markets, like all markets have cycles – what goes up has to come down. The final chart is for me the most interesting. It tracks the moving annual total of property sales as a percentage of all private dwellings in NZ. The long-term average (1992 to 2013) is that 5.9% of all dwellings are sold each year. The current level is 5.0%. The level of transaction is still well below the long term average, but considering the "new normal” that we may well be experiencing in the property market, post the GFC, then we may well not see the heady highs of 10 years ago of 8% of all homes being transacted as that rampant period of speculation and investor fever is well passed. To me it ‘feels’ like we are going to see some cooling of property sales, this will likely see year-on-year drop in sales growth, this is likely to lead to a rise in available inventory of homes on the market and thereby ease some of the markets and edge them out of being sellers' markets. A consequence of that could well be an easing in the price increases of property and even some degree of a fall. That scenario is good for everyone (possibly with the exception of the real estate agents). 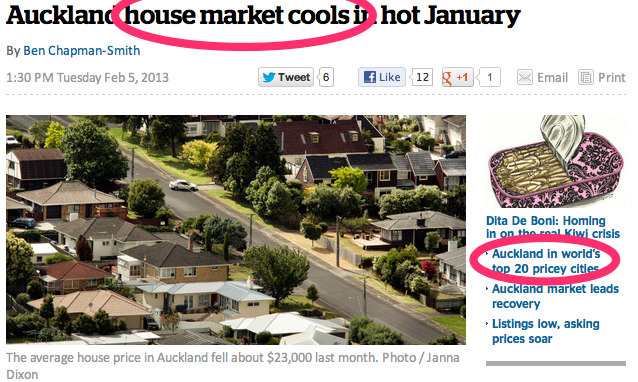 The Auckland property market is not suffering from a low level of listings. The property market in Auckland is experiencing a lack of selection of property to buy caused by high demand which is depleting inventory. It may seem a pedantic point but I think it is important. The analogy would be for a warehouse where the shelves seem only half full. The delivery from suppliers has not changed much over the past year but with more people coming into the warehouse and buying – even buying the dented and dusty products there is less stock on the shelves. Looking at the data from REINZ and Realestate.co.nz published monthly highlights exactly what is going on and thereby avoids alarmist or self-serving statements like “number of properties being listed for sale was still way down" as stated by Helen O’Sullivan of REINZ, and "It's quite a battle to find the house that you actually want to buy, because of the low number of listings," from ASB chief economist Nick Tuffley. Real estate agents want to talk about low levels of new listings, as their business is to list properties. It is admittedly hard to quantify demand in the property market, as sales volume is a resultant outcome of satisfied demand, unsatisfied demand that is sure to be high in the Auckland market at this time is harder to quantify. The facts as shown by the data of new listings from Realestate.co.nz shows that for January the number of new listings coming onto the market was no lower than the past 4 years of January’s – January is a low month. 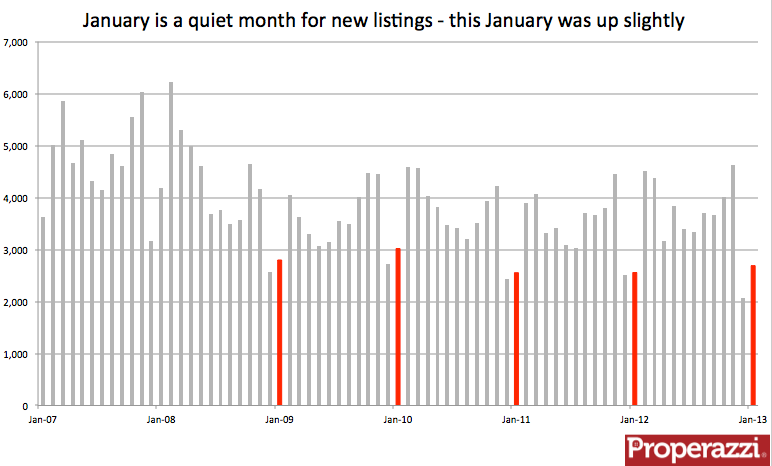 Examining the seasonally adjusted numbers from Realestate.co.nz as the chart below shows provides a useful perspective – January represented a very average month at the seasonally adjusted level of 3,594 new listings – there were 23 months in the past 4 years with less listings and 25 months with more listings. 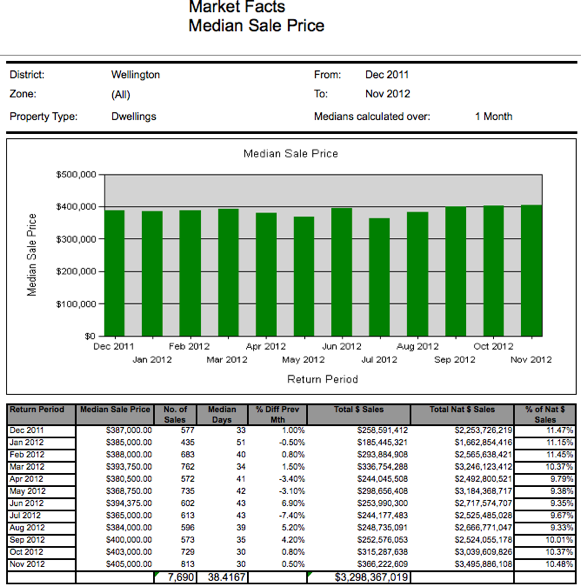 The core number to examine is inventory – the number of properties on the market. At the end of January this year there were 8,622, a year ago there were 11,162, in January 2011 there were 13,349 and in January 2010 a total of 13,396. 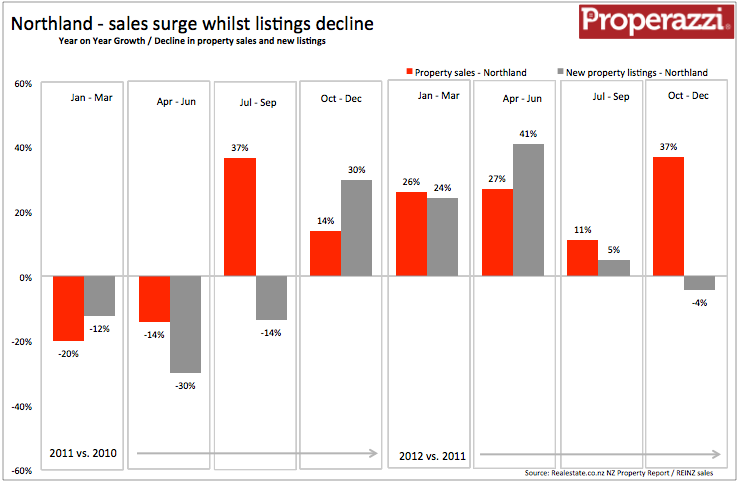 Property sales are up and property is selling faster. Very importantly there is less “redundant stock” on the market – property that at one time in the past 4 years might have been hard to sell is now selling; thereby reducing the available selection of property on the market. This is best shown in the chart below which shows actual sales, listings and inventory of houses on the market over the past 4 years – that red line showing the extent of the decline inventory is the most telling. As the sales over the past 3 years (as shown by the yellow average sales line) goes up so inventory falls. The core analysis of the property market as with any market is the balance between supply and demand. In the case of property this relates to sales and listings - the balance represented by sellers and buyers. Each month the relevant data is published, in the case of sales by the Real Estate Institute and for listings by Realestate.co.nz. In the past I have liked to aggregate these two sets of data to see the trend in these two indicators paired up. Analysed on a quarterly basis, the reports for the whole country as well as each region provide a valuable view of where the market is heading. The last such report was published in July for the 2nd quarter of 2012. I have updated the data and provided below the charts for the final quarter of 2012 - the 3 months ending December. The level of sales in the final quarter of 2012 increased again up 27% vs prior year whilst new listings were up only 4% indicating that the overall market in NZ rmains tight with a strong demand and limited supply. Sales in Auckland in the final quater of last year staged another leap with a 39% year on year growth, this is now the 8th straight quarter of consecutive growth. 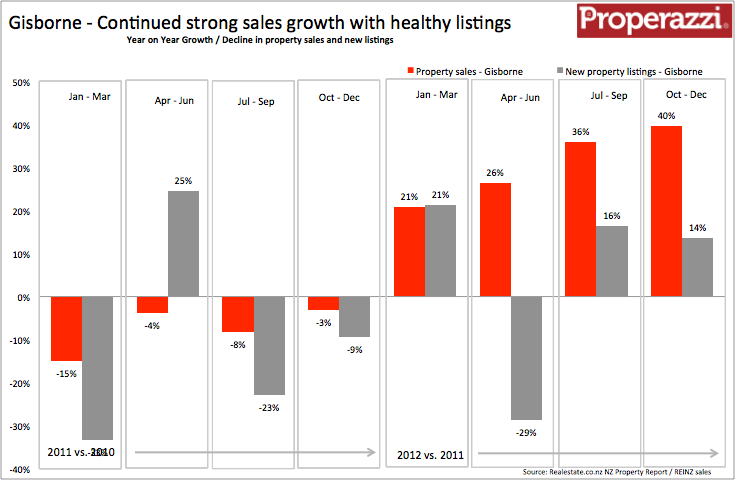 Whilst listings are showing a consistent 4 straight quarters of growth their rate of growth is far behind the growth in sales. Wellington saw a strong surge in sales in the final quarter up 25 on prior year, however as with so many regions the level of new listings failed to keep pace with this demand only rising 4% year on year. Sales in the Canterbury region were up 11% in the final quarter of 2012 with new listings up just 2%, these rises are modest as compared to the earlier period in the year; however that period was off the very low base of the earthquake in the first quarter of 2011. Sales in the Northland region enjoyed a strong surge in the final quarter of 2012 rising 37% year on year. The year overall has seen strong growth in sales volumes. However on the supply side listings wre down 4% in the quarter and show a steady decline in growth through the year indicating a tightening of supply. The property market in the Coromandel lags behind the growth in other regions of the country with sales down 3% in the final quarter following a 20% growth in Q3. On the supply side the market has seen a resurgence of listings up 11% year on year in the final quarter. Sales grew by 27% in the final quarter of 2012 as compared to the prior year up from 13% in the third quarter. Listigs coming onto the market though rose only 7% indicating the tightening in the market. Sales surged in the final quarter of last year in the Bay of Plenty up 28% year on year, however listings are failing to respond fast enough to this surge with just a 3% rise in the quarter following a 9% fall in the prior quarter, adding to the tightening of supply in this region of the country. The property market in Gisborne continues to experience a strong resurgence with sales up 40% year on year in the final quarter and new listings up 14% - somewhat behind sales but tracking in the right direction to support the new highly active market. The property market in the Central North Island continues to contract with sales only up 6% in the final quarter tracking a declining trend of growth through the year. Listing equally have been seeing slower growth with the final quarter seeing a 15% decline year on year. Property sales in the Hawkes Bay saw a strong surge in the final quarter of last year up 32% year on year. Listings also rose 12% to demonstrate an active and well balanced market. A very strong end to the year saw sales in the final 3 months of the year surge 30% in the Taranaki region a consistent growth witnessed over the whole year, however unlike other regions listings are coming onto the market in large numbers up 37% in the final 3 months of the year. Sales across he Manawatu Wanganui region rose 8% in the final quarter of the year with listings up 13%. The past 3 quarters have seen a faster rise in new listings than sales and this is likely leading to a larger inventory of properties on the market - good news for buyers. Sales in the final 3 months of the year surged 38% in the Wairarapa to see a continuation of what has been a very strong year for sales in the region. At the same time the level of new listings whilst not showing the same levels of growth is adding to the available pool of properties on the market. The property market in the Nelson region is continuing to show no growth. The final quarter of the year saw sales up just 2% whilst new listings fell by 3%, this trend has been seen over the past 3 quarters of 2012. 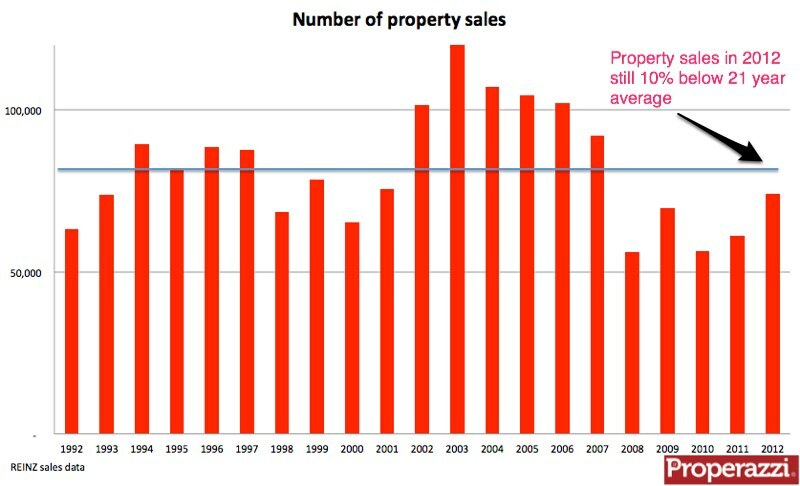 Property sales in Marlborough surged in the final quarter of the year up 50% on the same period in 2011. The year overall has seen strong growth in sales and strong levels of new listings providing a perfect environment for property sales. The property market on the West Coast is suffering significantly over the second half of the year having seen a strong start to 2012. The sales in the final quater were down 5)% with listings down 8%. In the Queenstown Lakes region including Central Otago the final quarter of 2012 saw a surprising and a significant surge in sales up 39% as compared to prior year - this following some tailing off of sales growth through the earlier part of the year. Listings which had fallen significantly earlier in the year are on the increase but there looks to be a tightness in the market. Sales in Otago surged in the final quater up 19% with new listings up 12% which is identical to the increase in Q3 this would seem to indicate that the market is active and well supplied with property for sale. Sales in Southland grew 12% year on year in the final quarter of 2012 with new listings growing ahead of this by 21%, this follows an 11% growth in new listings matched to a 2% rise in sales in Q3. This would indicate the market is active with demand but buyers have plenty of choice. If there is one certainty with property prices is that there is always uncertainty! - That is never more true than with the Auckland property market and its property prices. The headline from earlier this week speaks of property prices falling in Auckland as the market cools in January; yet a few days later another report seemed to scare us with the view that Auckland is within the world's top 20 priciest cities! What can we make of the mix of data and where is the market going? My view is you have to be focused on core data and avoid being hijacked by random erroneous data, reports and surveys. The good news is that we in NZ do have good property data, it is well structured, easily accessible and is right up-to-date. 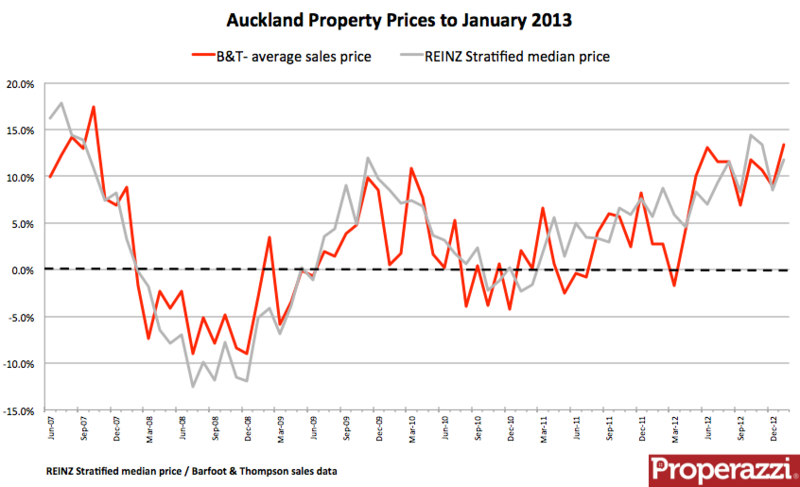 The most reliable indicator of property prices in Auckland is the REINZ Stratified median price index. Published monthly it uses the most recent month's sales data and makes adjustments to ensure that for example higher sales in high priced suburbs, matched to other extremes such as low sales in low price suburbs does not skew the median price. The method is professionally administered by The Reserve Bank and used as a trusted pricing method for property reporting worldwide. The latest data including January for Auckland shows that the last 2 months has seen property prices ease. From the peak of $578,150 in November the stratified median price has slipped to $548,750. 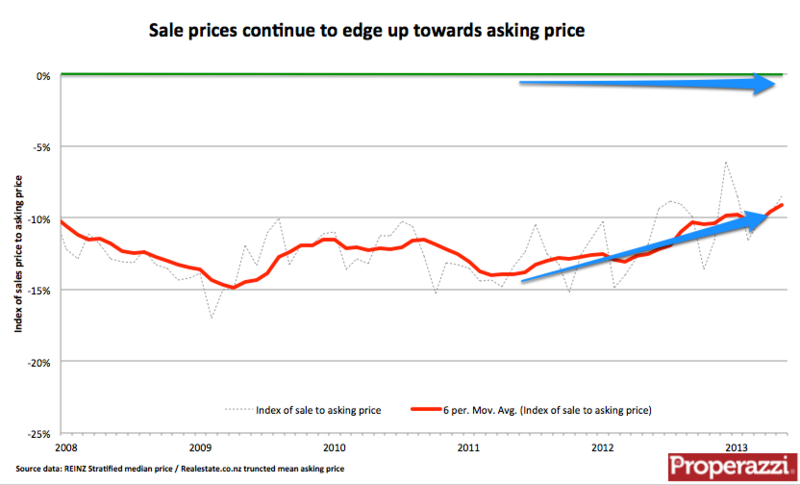 As the chart above shows this is now 13.3% above the peak of prices seen before the GFC in 2007. 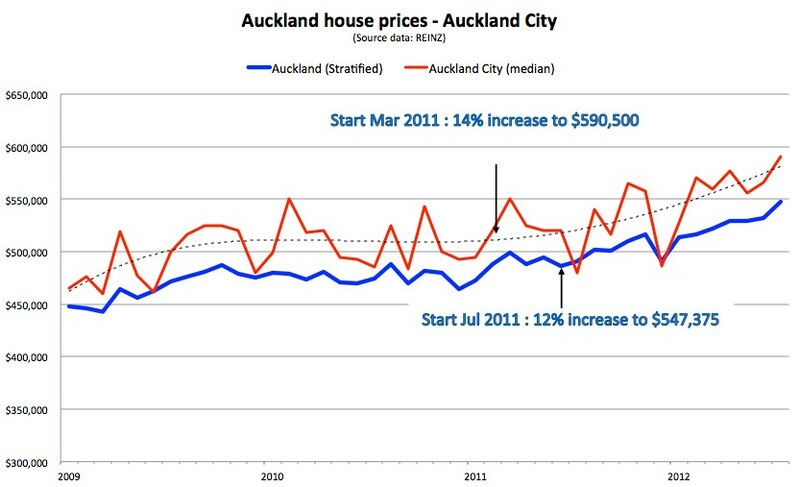 However as a cautionary reminder if you adjust for inflation as the chart below shows Auckland prices have barely made any gain in the past 5+ years. In November we came within 1% of the CPI adjusted peak price from July 2007 but the past 2 months has seen this fall to 5.3% below that peak. So based on this you would have to assess that property in Auckland barely keeping pace with inflation over half a decade. There are other sources of property price information available for Auckland, the most recognised one is the Barfoot & Thompson data. Now B&T are the largest real estate agencies group in Auckland and currently represent around 40% of all sales in the region which makes them a key indicator of the market. However they do not represent the whole market, 6 out of 10 properties sold in Auckland are not sold by B&T. Additionally their property data which is released within the first few days of the month and therefore gains early media attention is very raw data, however a major weakness of their data is that their property prices are just based on average price, rather than median or stratified median which leaves the data open to fluctuations, especially with high priced property sales. 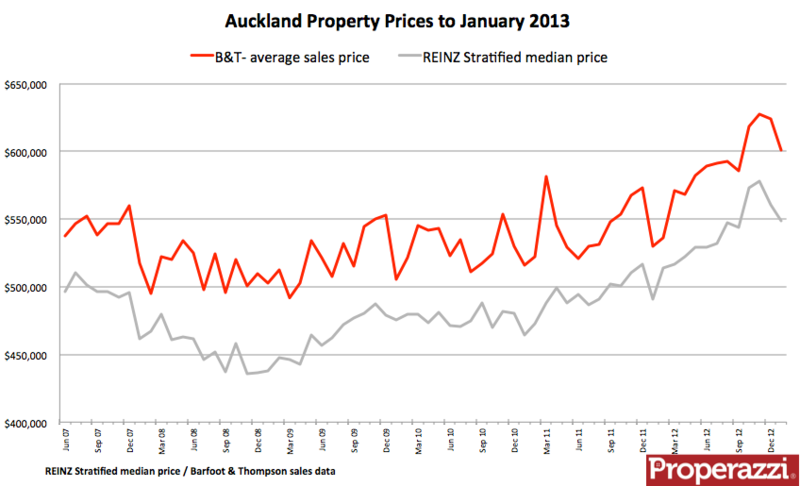 Whilst the average price of sales by Barfoot & Thompson may be out of line with the REINZ Stratified median price for Auckland property as the first chart below shows, the trend of price movements as the second chart shows is more consistent. 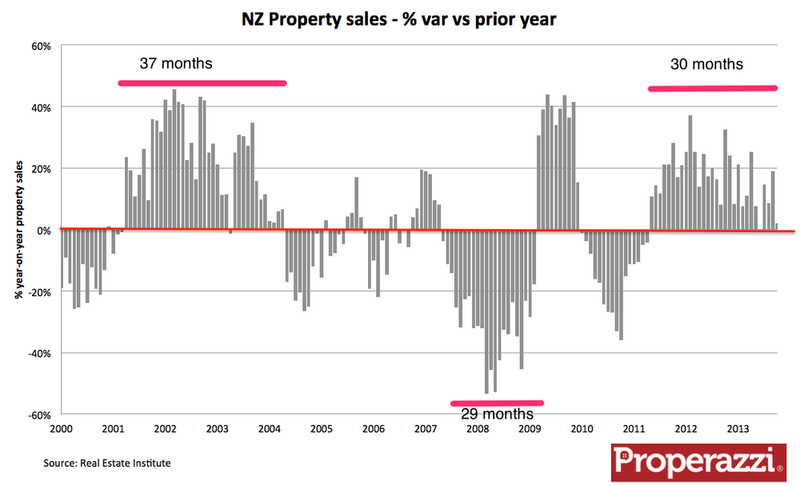 Have property sales returned to normal levels yet? "Property sales up 21% on prior year to the highest level since 2007" read the press release from REINZ summing up the past calendar year. Certainly the property market has seen a recovery which started last year rising 9% from the low of 56,000 in 2010, and then this past year rising a further 21% to the total of 74,000 property sales. 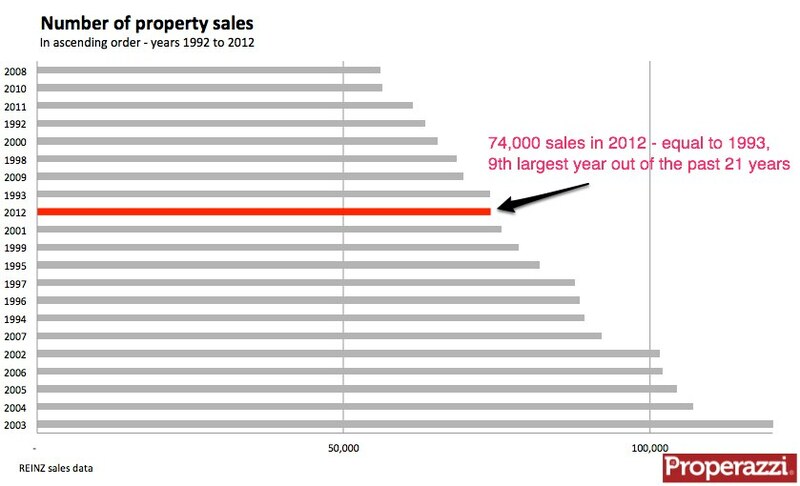 However as the chart above shows that sales last year were 10% below the average of the past two decades. Ranked for those past 21 years from the lowest sales year (2008) to the highest (2003) shows in fact that the total sales for 2012 was identical to the year 1993 - can anyone remember that far back in terms of real estate ?? That situation where sales last year totaled the same as nearly 20 years ago brings to mind the analysis of relative sales to the number of dwellings in this country. In 1993 according to data from Stats NZ there were 1.214 million dwellings and therefore the sales in that year of 73,959 represented 6.1% of all dwellings being transacted just above the 21 year long term average of 5.9%. At this time there are estimated to be (we are awaiting the next census) 1.558 million dwellings, so the total sales of 74,000 in 2012 represents just 4.8% of all properties being transacted in that year. Clearly we are yet to return to what might be called normal levels. It would make logical sense to see a correlation between the asking price for property and the selling price. One will lead the other. There is likely to be a lag between the trends and equally there is likely to be a difference, naturally asking price will be higher than sale price. All seems logical and intuitive – that was what I thought, and that was my first reaction when I read the news article this morning regarding the monthly NZ Property Report from Realestate.co.nz. The article quoted Paul McKenzie as saying “there was no significant discrepancy between asking and sale prices. They're normally pretty close. There are months when there are slight differences in ups or downs, but you're talking small percentages." That type of comment always makes me keen to dive right into the data to see what the facts actually show and what can be interpreted. What I found was interesting – nationally there is a consistent ratio between sales price and asking price, but in Auckland not. Auckland is currently seeing a fairly significant convergence with the gap narrowing to around 5%. 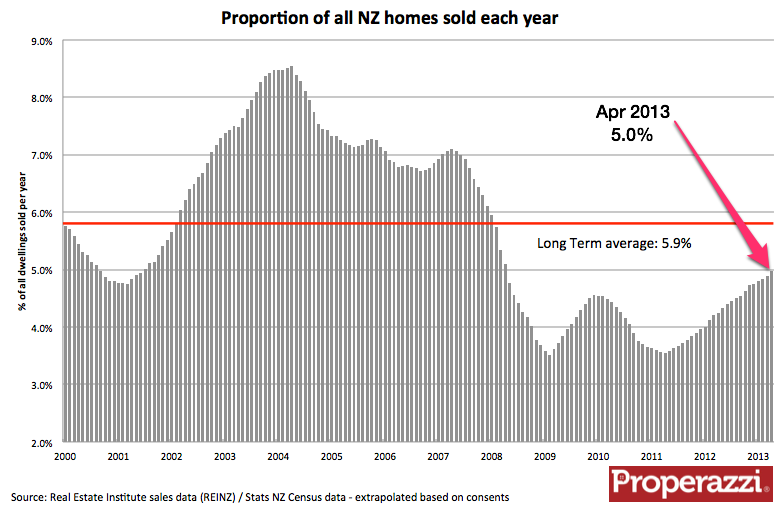 Taking the national data from REINZ of stratified median sales price and the Realestate.co.nz truncated mean asking price for the past 5 years provides a picture of the correlation as shown below for the data for the whole of NZ. This shows a pretty stable picture over most of the past 3 years whereby the sales price is around a level of 15% below the asking price. There is a slight rise over the past 6 months. (Note the chart shows the 6 months moving average as the solid red line). Now there is an important point of interpretation here. The asking price used in this analysis is based on all new listing coming onto the market in the respective month. The asking price is either the advertised price or the mid point of a price range if no advertised price is shown as in the case of auctions, tenders and other pricing methods that do not display a price. Now contrast the chart for NZ with the same chart for Auckland and we see a whole different picture. Overall the correlation between asking price and sales price is smaller and over the past 18 months the trend has been a significant narrowing of the gap to where it is now close to just 5%. It would appear that whereas across the whole country property sells for around 15% less than the asking price, in Auckland it is just 5% less. So what could explain this situation? 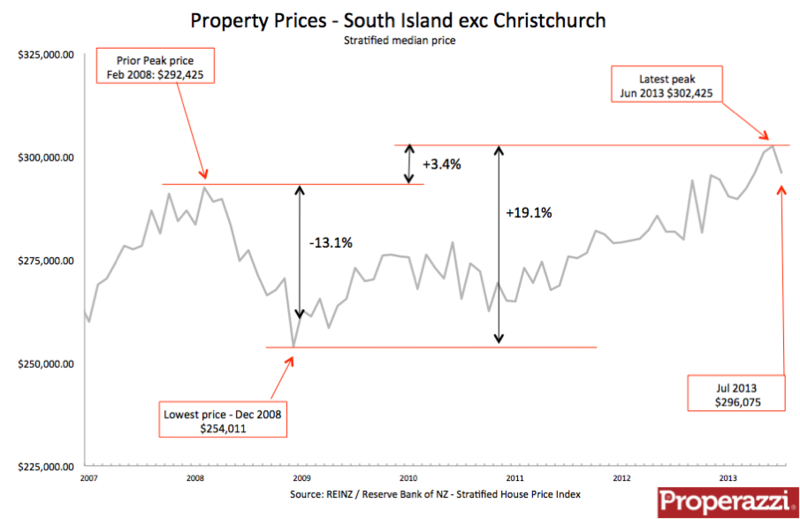 – is it a function of the rising Auckland house prices? Could it be more cautious real estate agents not pricing property too far ahead of expectation in Auckland? Or could it be a whole different answer, that for example agents around the rest of the country try and be more bullish and advertise property with asking prices at least 15% higher to see what potential there is in the market. The fact is I don’t know as there is no further data to analyse, however I could be tempted to offer this one hypothesis to see what reaction it provokes. Auckland has a much higher level of property marketed for auction than any other part of the country – somewhere around 25% of all new listings. Properties listed for sale by auction are not displayed with a price but with a range. Agents who want to attract as many buyers as possible, maybe pitch a property with a range that is below the current market price. Certainly anecdotal comments in the media constantly seem to focus on buyers becoming frustrated that property they go and see (after checking out property online) ends up selling well above the expectation. Maybe what we need is for property websites as the primary display medium for real estate to display a clear price range for all property so as to bring more transparency into the process? The Real Estate Institute released the October statistics to the headline of the "market roars into life" - well certainly it was a very active month with sales up 33% on the same month last year and property prices setting new records. I think it is useful to see the property market as an industry employing as it does over 10,000 active sale agents and transacting over 72,000 properties in the past 12 months. The value of these annual level of transactions has grown in the space of 12 months by $7 billion; growing from $25.6bn in the 12 months to October 2011 to $32.6bn in the past 12 months. 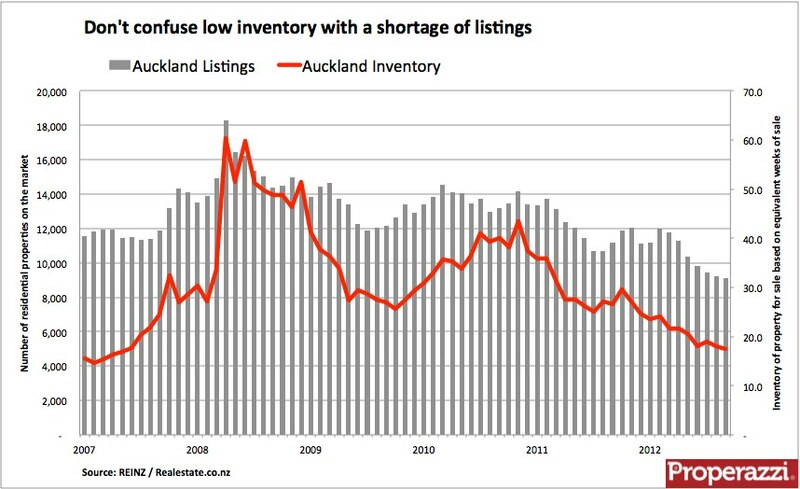 For me the question remains - is this an Auckland phenomenon or is the "market roaring into life" across other parts of the country? Just last month prompted by this question I examined the make up of the property market and the representation of Auckland within it and came up with the conclusion that the activity in the NZ property market is largely the Auckland factor. Applying the latest data for October to the same set of historical sales data confirms this continuing trend. 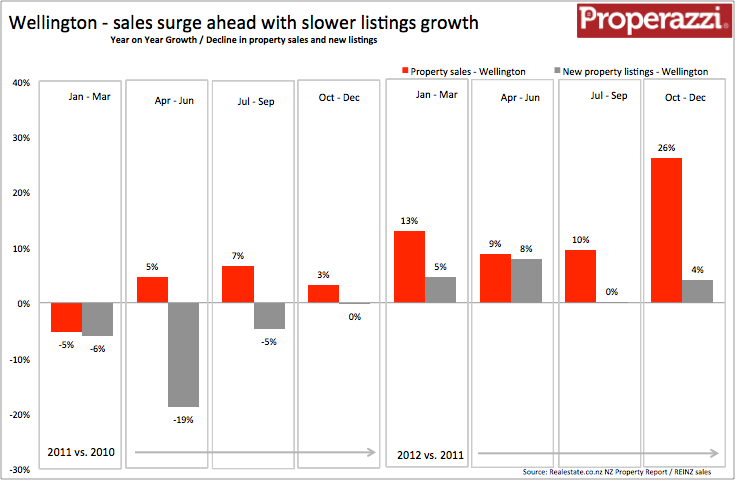 In October Auckland represented 39.4% of all sales nationally, up from 39.2% in September and up from 36% a year ago. The chart below shows this trend with the red line representing the moving annual total percentage which is growing very strongly through 37% of all sales. When viewed as sales tracking on a 12 month moving average basis the divergence between Auckland and the rest of NZ is very clear with the gap continuing to widen, although there was some pick up from outside of Auckland. As to the other major regions of Wellington and Canterbury, their respective performance is viewed in these charts below. Wellington is showing some signs of growth, nothing of the order of Auckland and certainly fairly flat over the past 2 years. 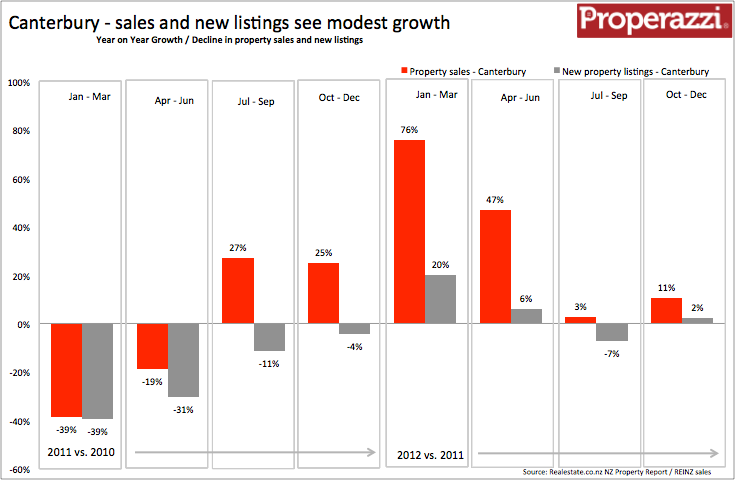 Canterbury whilst showing some strong growth through 2011 has seen a plateauing in for the majority of 2012. It is often said that a trend needs to be established for at least 2 quarters before you can start to define it as a trend - that is certainly the official wisdom with economic recessions. As for the property market it is often safer to hedge your bets and look to 3 or 4 quarters before saying a trend is definitely a trend. 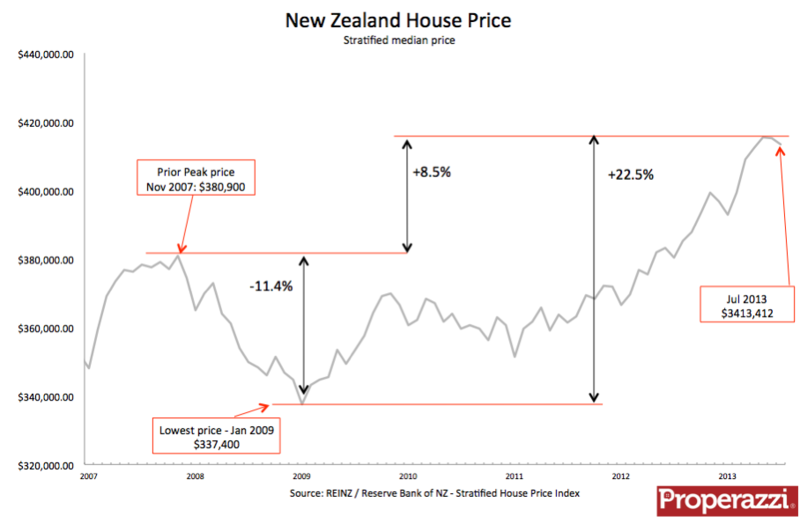 In the case of the Auckland property market and the movement in property prices I would be confident to say we are seeing a significant and enduring trend of price increases. The most recent statistics from the Real Estate Institute for August shows that across the wider Auckland region prices set a new high of $505,500 when judged as a median sales price in the month and $547,375 when judged on the more accurate measure of Stratified Price. These prices were up respectively 12% as compared to August 2011. The media is certainly alert to this trend and I was asked to comment on this subject in the TV One news segment on Sunday. I thought I would take the opportunity to present the sales price data in a little more detail to show the trend over the past 3 years and in segmenting Auckland into the main 4 regions. Just to be clear around the source of property price data. The Real Estate Institute (REINZ) is in my opinion the most valuable data to use as it is collated from actual transactions of unconditional sales in the month making it the most timely data. The data is most often presented as a median price to ensure that extreme priced sales (ie for example $10+m) do not skew the data. In addition and with the assistance of the Reserve Bank they have developed an excellent and far more accurate measure called the Stratified Mean. This price index uses a statistical model to remove the influence of more of one price range of property in key suburbs do not skew the data. 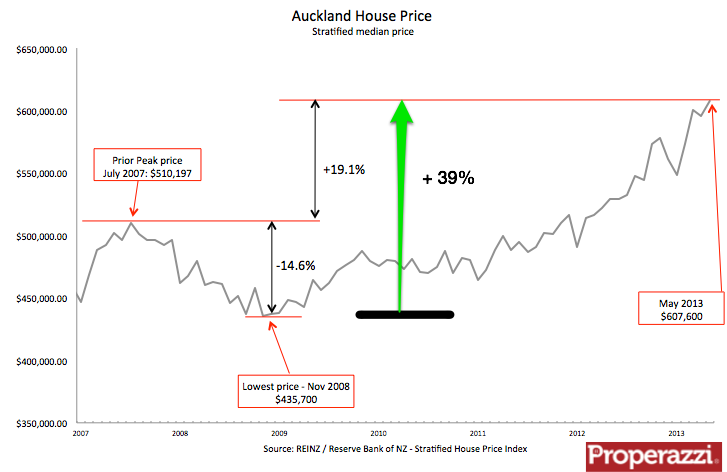 Looking at the wider Auckland region to start with the chart below shows the trend of prices measured as both median and stratified going back to January 2009. The solid blue line presenting the stratified price shows the first strengthening of prices across the region late in 2010, this trend really became established in July of last year when since then prices have consistently risen by 12% over the period to the current peak of $547,375. The pure median price as shown by the red line shows a slightly earlier take-off point of May of last year when from that period prices have risen a total of 9% to $505,500. Turning to each of the 4 regions within Auckland the one showing the greatest appreciation in property prices is the North Shore. As shown from the chart below prices have risen by 16% from the starting point of 12 months ago - well ahead of the regional growth of 12%. The new peak of sales price on the North Shore of Auckland is now $625,173. Auckland central suburbs is where the majority of interest has been shown in recent months and in this region property prices have certainly been on the move. The August median price peaked at $590,500 up 14% from the start of the trend back in March of last year. The year-on-year comparison for this region does show a very alarming 23% increase but this should be taken cautiously as the chart below shows that August 2011 saw a very significant one-month fall in median price. South of the city in Manukau property prices have seen a strong trend of increase starting back in March of last year. Over the 17 months prices have risen 8% to $493,000 with a new peak in June at $495,200. Out in West Auckland the trend in property prices has been somewhat more subdued than in the central and North Shore area. 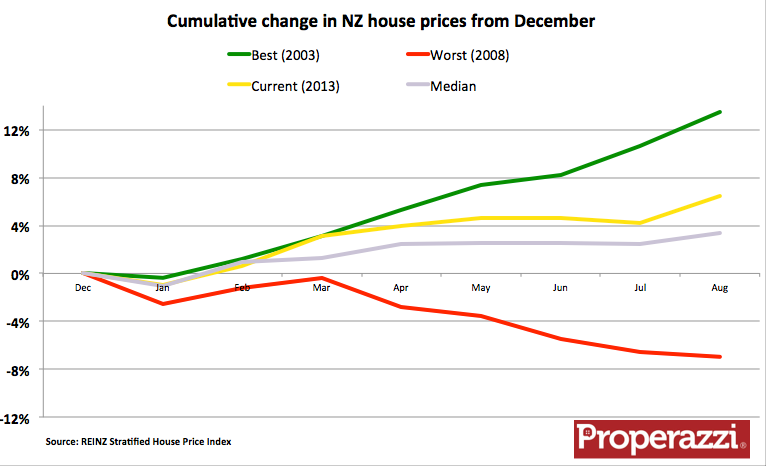 Here in the Waitakere region prices are reaching new levels although August did not see a new peak month. 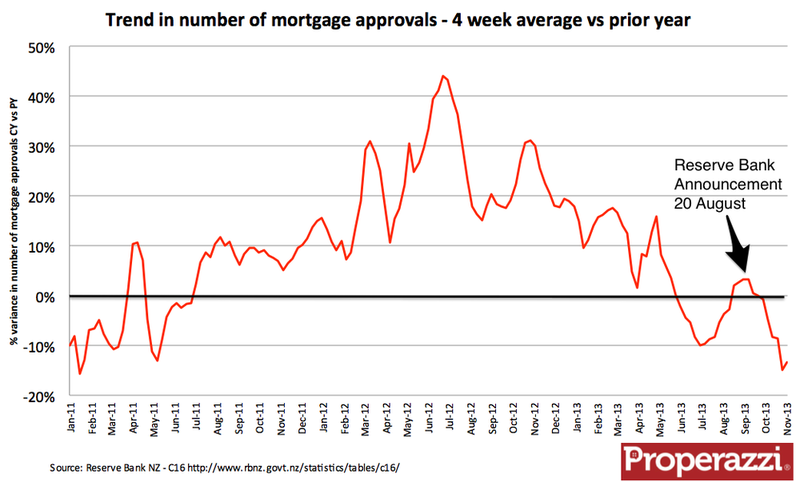 The trend over the past 11 months since the upturn began is a more modest 5% increase to $410,000.